This three-hour adventure on a Catalina-style sailboat is limited to six people for a comfortable, semi-private experience -- or, find five friends and fill up the whole boat! Sail in San Diego Harbor during the day. Sit back and relax to enjoy the water views while enjoying complimentary beer, wine, soft drinks and snacks. Bring your own music to play on the surround-sound speakers! 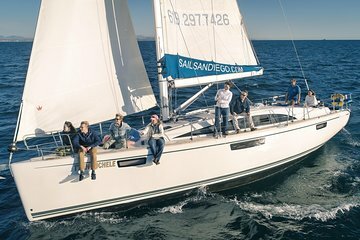 Whether you’re on vacation, celebrating a special occasion or just looking to take advantage of a beautiful Southern California day, this small-group sailing trip in San Diego is a great way to spend time on the water with your loved one or a group of friends. The comfortable boat is limited to six passengers, so if you'd like to make it a private adventure, book all six spaces and bring along five buddies! Set sail on a daytime adventure in San Diego Harbor to soak in the warm sun on the Pacific with the glistening city lights behind you. Both trips are three hours long. No matter which sail you choose, you'll enjoy complimentary beer, wine, soft drinks and snacks. Provided polar-fleece jackets, hats and wind gear are on hand if you get chilly. There are also complimentary sunglasses, sunscreen for your use, too, and provided binoculars allow you to admire the coastline or look for wildlife! Bring your own music to plug into the boat's surround-sound system to further personalize your trip. I would highly recommend this sailing excursion to anyone visiting or even locals. The boat was clean and our Captain (Capt'n Frank) was very willing to tailor the cruise to our needs. We chose the 3 hour late morning cruise of the San Diego harbor. Capt'n Frank was extremely professional and knowledgeable of the harbor. The package includes beer/wine/soft drinks and light snacks (chips/cookies/etc.). Capt'n Frank was willing to answer all of our questions and did everything to make us comfortable on the cruise. I give this cruise 5 stars! Our sailing trip w Anthony was amazing.. the view,the music, was so relaxing. I look forward doing this again next year. My friend and I had an absolutely fantastic experience on our sailboat expedition. It was an intimate group of 5 plus our superior captain, Anthony. He was fabulous. Very experienced and informative. I can't wait to do another trip. Will definitely book again through sail San Diego and request him. I have already recommended him and the company to my friends. Great afternoon! "Happy" Captain Greg was awesome. Funny, knowledgeable and highly capable. The boat was clean and only a year old. We had snacks and wine while Greg told us a little about the sights and even let some take the helm. Fellow passengers were fun. Very enjoyable and well worth it. Trip was worth it. Captain was very informative and made the trip very enjoyable. 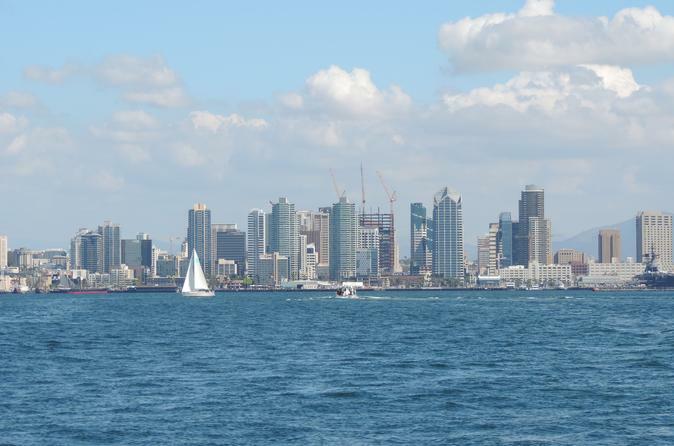 Great way to see San Diego and surrounding areas with a different perspective. Boat we were on was new and the quarters were first class. This was such a lovely afternoon. The sun was shining and the time we spent on the boat was so relaxing. Captain Greg was very nice and full of information about the harbor area, and he even let my daughter captain the boat for a bit! Highly recommend! booked an afternoon sailing excursion with 1 days notice to Viator and it didn't seem to be a problem. Boarded to a smiling crew member who gave us 6 passengers the low down on how things were to take place. Met the days captain, Happy Captain Greg which had a few more words of wisdom and we were off. What a pleasant sail boat ride we all experienced, Captain Greg spoke with knowledge of the surrounding sights all while keeping an watchful eye on the activity all about us, making sure we were safe. Once out of the harbor we all had an opportunity to steer the vessel and roam freely about it. Plenty of picture taken all while chatting with the other passengers and of course Happy Captain Greg had his own stories to share. All in all a great time had by all and will most certain to do this again. We thoroughly enjoyed our afternoon sail around San Diego Bay. The fleet of sailboats is well maintained and nicely provisioned with snacks and beverages. The captains are skilled sailors and great tour guides. If you book on-line, Id recommend calling to check in soon after to confirm, as we had to move our sail time from noon to 4:30 because of overbooking. In spite of this, we had a great experience! Captain Sean was the best! !